Disney's Mike Goslin showed off the company's brand new head mounted display at D23 Expo 2017. Plenty of awesome news breaking from D23 Expo 2017 in Anaheim, California. Mike Goslin from Disney Advanced Technology showed off something that the Imagineers have been working on for some time. In a partnership with Lucasfilm and Lenovo, Disney will bring AR to consumers soon. Holochess and Lightsaber demos were shown in the brief reveal at D23. The brand new AR HMD is powered by sliding a smartphone into it, and did not appear to block line of sight. Disney also announced that fans can get their hands on the latest Star Wars AR experiences in a partnership with Best Buy. 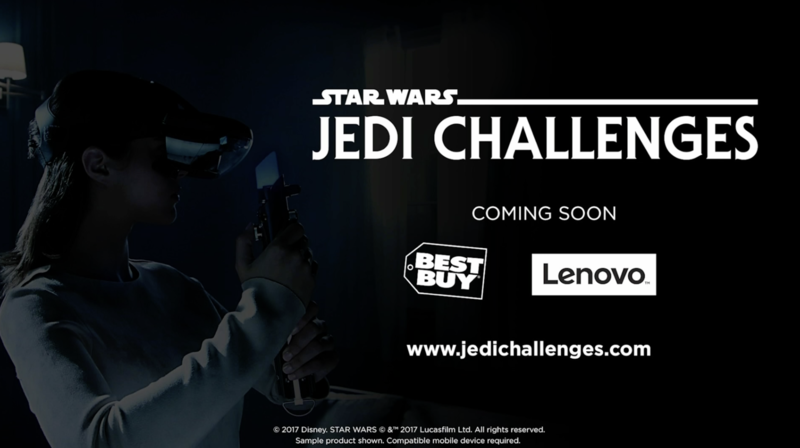 Fans can go to the Star Wars Jedi Challenges official website for more information. I welcome our AR overlords. Whoa, I completely missed it's their own headset! Skimming the news I just assumed it was Lenovo's Mixed Reality headset for Windows 10. Eh, Disney has quite a bad rep for quickly discontinuing digital stuff. May be wrong but I doubt this will last very long.